Wearing Dolce Vita dress, Zara sandals and The Quiet Riot earrings. Shot these a couple of weeks ago during church camp at UK Farm in Kluang, Malaysia. The idea was simple, a short getaway with the church family, and full on back to back conferences, bible studies and just fellowship in a rustic farm stay. I loved the concept of UK Farm, pretty much Malaysia's idea of a perfect backdrop, platations, farm animals (got to feed all the goats, see the sheep running about, ukno) and the mandatory farm tour, simple fun and games with your friends and family and just quality time away from the hustle and bustle of city life. I packed my bags, came just expecting to drown myself in CHURCH but it was surpisingly an eye opener and I miss it. Our stay, neither were the facilities, perfect, there is so much about the place that needs to be upkept properly but there is also something very charming I found about the place, being able to stay in a little cabin literally in the middle of nowhere. It felt like camping, our food was prepared daily before we would proceed with our church or farm activities that consist of archery, or goat chasing which turned out to be quite a laugh, horse riding etc. 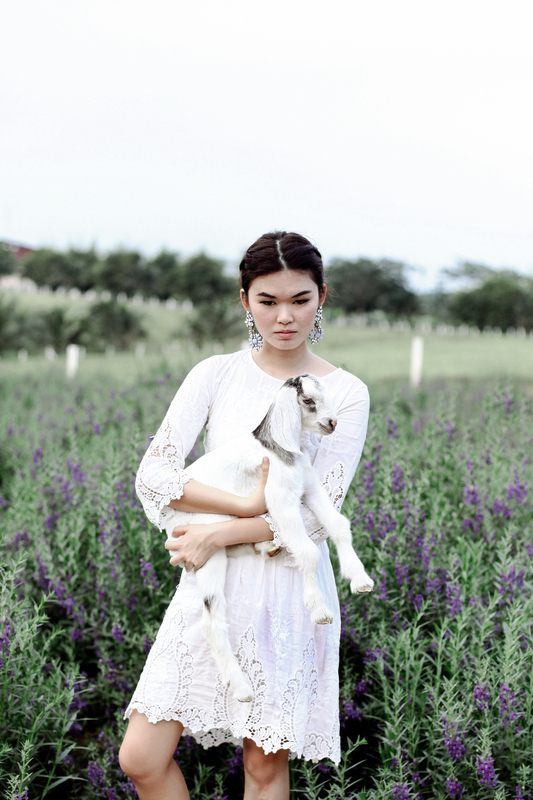 I somehow managed to get myself a little goat and shoot in the lavender fields, it turned out to be a dream come true because you'd normally get the crazy eyes for requesting a goat for photo-taking. And specifically in the lavender fields. And I did, the entire church and staff thought I was crazy but I made sure I got what I wanted as I definitely needed a little souvenir from my time spent here. So the kind staff motocycled a little kid over for me and I got my wish! I guess I do love going all the way out for my photos…. Heh! Thank you, Hazel, for the photos! The UK Farm Agro Resort is situated in Johor, Malaysia, about an hour's drive from Singapore. *Ps, thank you for the responses to the video diary! Definitely worth doing more in the future!